A truly Ski In-Ski Out property means that guests can walk out the door, put on their skis and ski either onto a ski run or ski to a lift and they can also ski from the top of a lift back to their door. A broader definition, used for many condominium properties, is that the property borders the ski area and guests can either ski from the edge of the property to a lift, or a ski run and then ski back to the edge of the property. Northstar: This ski area offers the most Ski In-Ski Out possibilities. Some of the homes in the Big Springs neighborhood are Ski In-Ski Out. On the mountain there are several new Ski In-Ski Out high quality developments near, and some connected with, the Ritz-Carlton Lake Tahoe: Stellar Residences; Martis 25, for home-sites and new custom homes; Constellation Residences for luxury condominiums, The Ritz-Carlton Residences Lake Tahoe for luxury hotel condominiums; and for townhomes, Home Run, Trailside Loop and Stellar Townhomes. Click here to view current listings of Northstar Mountainside Properties. Squaw Valley: A few homes in the Granite Chief neighborhood but they do not come available very often. Tahoe Donner: A very few homes border the Tahoe Donner down hill ski area and only come available occasionally. Sugar Bowl: Again only a few homes in and around the ski area that do not come available very often. 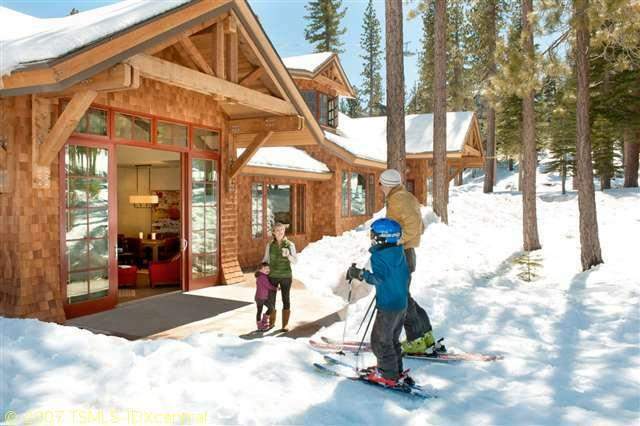 Donner Ski Ranch: There are a few slope side and base area condominiums that come available occasionally. Homewood: The Homewood Mountain Resort Ski Area Master Plan, that is in the regulatory approval process, when approved, will offer some home-sites that are truly Ski In-Ski Out. Northstar: Northstar Village, and a few of the older condominiums in the surrounding neighborhoods. Squaw Valley: Squaw Valley Lodge, Village at Squaw Valley and Resort at Squaw Creek. Homewood: The Homewood Mountain Resort Ski Area Master Plan, when approved will offer base area and mountain side condominiums.